The Custard TV: Chilling in Sabrina: We're not quite sure what to make of it. Chilling in Sabrina: We're not quite sure what to make of it. The long-running Archie comics have been a source of much TV, film and even music over the years. Their vanilla, 50s-nostalgia-tinged peppiness and general lack of darkness have been one of the reasons for their longevity, as have their characters, which have been reinterpreted in other media. At the movies, the most famous spin-off was Josie and the Pussycats, which some rate as one of the most overlooked and greatest movies of the 21st century. On TV, however, we’ve had Riverdale. When that show was first mooted, the immediate question was how it would work, particularly on young adult-focused network The CW. The short answer was very well since its creators basically decided to do their own version of Twin Peaks, with murder-mysteries and more. It wasn’t what people expected, but it was… good. Riverdale‘s been doing quite well for itself since, so naturally, a spin-off was suggested based on another Archie character: Sabrina the Teenage Witch. Of course, there’s already been a movie adaptation followed by a rather famous, long-running TV adaptation, Sabrina The Teenage Witch. Fully in keeping with the comic, Sabrina the Teenage Witch was a light-hearted sitcom all about a teenage girl’s struggles to go to a regular US High School and have a regular mortal life while juggling the fact she’s a witch with two equally witchy aunts and a talking cat. It was… nice. So again, given the Twin Peaks-isation of Archie in Riverdale, everyone wanted to know what the new Sabrina show would be like – particularly once The CW rejected the spin-off and Netflix picked it up instead. It’s not that it’s bad – far from it. 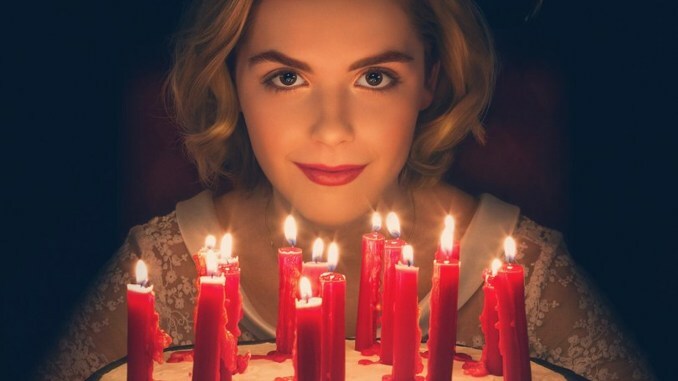 Sabrina is played by Mad Men‘s Kiernan Shipka, doing a sterling Melissa Joan Hart impression. It’s got a great cast of British actors, which includes the likes of Chance Perdomo, Lucy Davis (The Office), Richard Coyle (Coupling) and Michelle Gomez (Green Wing, Doctor Who). It’s got a great cast of US sitcom actors, including Bronson Pinchot (Perfect Strangers) and John Rubinstein (Crazy Like A Fox). It sounds so promising. It’s just… You think witchcraft these days and it’s Wicca. It’s women together worshipping nature gods and goddesses for the benefit of others. All those witches who were killed over the years? Either harmless old victims of patriarchal prejudice or harmless innocents, persecuted for trying to use magic to help others. And when you think Sabrina The Teenage Witch, you think fun and games and talking cats. Benevolent wacky aunts. That kind of thing. What you definitely don’t think is “great satanic horror movies from the 1960s and 1970s”, which is what the show’s creator Roberto Aguirre-Sacasa is aiming for. Here the witches are genuine, honest-to-badness Satan worshippers. They do evil. They sacrifice virgins. They bathe in human blood. They murder each other and mortals. They eat each other (and maybe mortals, too). They genuinely do worship a hooven, goat-like Satan and sell their souls to him. Even Sabrina. Well, sometimes. Sort of. What are they thinking? The first season is a sort of seduction of Sabrina to the dark side. Half-mortal, half-witch and not yet 16, Sabrina is all set to sign the book of the beast and hand over her soul to Satan on her sixteen birthday as part of her Dark Baptism. However, she’s somewhat reluctant to abandon both her boyfriend Harvey (Ross Lynch) and friends Jaz Sinclair and Lachlan Watson. Evil aunt Mirando Otto can’t believe her reluctance, while slightly less evil and more comedic aunt Davis just says it’s something girls have always done in perpetuity, so why question it? It’s not a big spoiler to say that once Sabrina discovers she’ll lose her free will once she signs the Book of the Beast, she decides that maybe it’s not such a great idea. This annoys her aunts, her louche cousin Perdomo, High Priest of her coven Coyle and Satan himself. The Dark One, therefore, sends his bride, the Mother of Demons, to possess a mortal (Gomez) and put in place plans to encourage Sabrina to sign in blood on the dotted line. Along the way to that fateful choice, we have Sabrina on trial. We have Sabrina doing a Harry Potter and going to evil witch school where she has to deal with curses, mean girls hazing her and murder. We have Sabrina resurrecting the dead and bringing… something else back, forcing her boyfriend to kill his own uncle with a shotgun. It’s dark, dark stuff, relieved only by the knowing performances of the cast, who are all acting as though they’re in Sabrina The Teenage Witch even though they’re in Rosemary’s Baby. It wasn’t until nearly the end of episode five that I found myself smiling and thinking to myself, “Ah, at last! Some real fun!” That didn’t last long, although there are occasional moments of relief, often when Coyle and Otto are in scenes together, or when Davis gets a job in a nearby bookstore. Naturally, there is a subtext of #MeToo and female oppression down the ages. Although actually it’s more text than subtext. The trouble is… you can’t help but feel, based on the evidence presented, that maybe patriarchy had a point in this TV universe. These are genuinely evil people doing genuinely nasty things and maybe sending witch-hunters after them wasn’t the worst idea in the world. It’s also a somewhat muddled take on feminism, with the narrative somewhat suggesting that female empowerment might need to cast its lot with Satan and take orders from men if it’s to get anywhere. Maybe season two will provide the flipside to that, but I found myself wondering precisely what the show’s message was? Screw WICCA (the positive female school group that Sabrina’s friends set up) and start loving Satan and all his little minions if you want to avoid being bullied and/or killed? Normally, these Netflix reboots ( Lost in Space) turn their first season over to origin stories that plop the viewer off at more or less the first episode of the original series. The format established, the second season is then episodes in the style of the original series. However, while Chilling Adventures does slowly humanise and redeem Sabrina’s aunts, add in Salem the cat, let Sabrina’s friends in on her secret and reveal the origin of Sabrina’s hair colour, the ending sets us up for yet eviler Sabrina. Fun-filled adventures with Sabrina next season? Unlikely. Even by the end, no one’s on especially cordial terms, let alone ready to head off down the Malt Shop together for hijinks. Of course, one should never review the show you want something to be but should review it on its own merits. The trouble here is that the show’s about as chilling as iZombie. There is some spooky imagery and there’s a chase scene in a maze early on that’s moderately scary. But “great satanic horror movies from the 1960s and 1970s” chilling? No. If you want to be terrified by something on Netflix, The Haunting of Hill House is the show for you, not this. 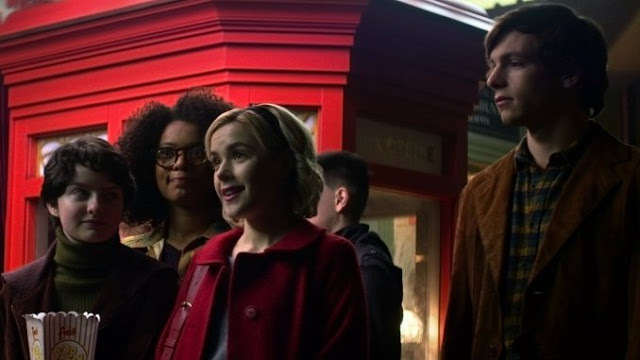 Instead, Chilling Adventures of Sabrina is a knowing, slightly macabre show pitched at slightly disaffected gothy youths that’s actually quite boring a lot of the time. I found myself forcing myself to have to watch for most of the show’s run because not a lot happens a lot of the time. There are great touches her and there, a marvellous cast and if Perdomo doesn’t go on to bigger and better things, there’s no justice in the world. I also admire the show’s ambition and daring to do something this different with the source material. But it just doesn’t work at pretty much every level. It doesn’t even have a talking cat. What a shame.